At a recent conference, where I was taking pitches and doing critiques, I was reminded of some of the most common problems of new and even not-so-new writers. I ended up getting a copy of this book from the bookstore and recommending it to a number of people. Some of them are writing fiction. Some are writing true stories. It doesn’t matter. If there is a story of any kind, this book will help. How will it help, you ask? It will help you “show” the story instead of “tell” it. By “show,” I mean let the reader see what you see in your head, experience what you feel in your heart, and understand why your story is important. In other words, the story becomes real and the reader is transported into it instead of hovering on the outside looking in. I have a copy of the original edition. It’s now been revised, but I’m sure that has only made it better. 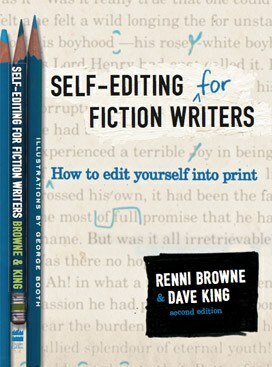 No, this book won’t all by itself make you a top-notch writer. It’s one of dozens of books I have on writing. But it’s a great place to begin. If you read each chapter and then look closely at your work and see how it could be better, and make changes accordingly, it can’t help but make you a better writer. Your library may have a copy. Otherwise, you can get it quite easily. Or you can learn more about the book at the website below. Thanks for the tip, NJ! I have requested it from our local library. I have a copy of this book. It’s one of my favourites along with “On Writing Well”. I have not read the new edition but plan to replace the early version. It’s a valuable resource.